What do you do if you’re over 65 years old, a mother of four and a grandmother of six, the first woman ever to be elected President in all of Africa, and the first black woman ever to be elected President anywhere? Why, you roll up your sleeves and get down to governing, of course. 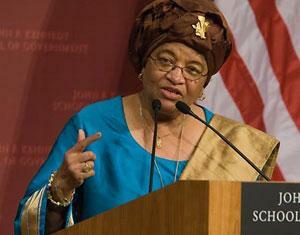 At least that’s what Ellen Johnson-Sirleaf, Liberia’s new President (and a K-School alum) has been doing, as she shared with us in a lecture last Monday. And if your country has just come out of a destructive civil war, then you celebrate something as basic as turning on the electricity again. Apart from that comment, her speech itself was dry, as perhaps any speech dealing with governance will be, and she didn’t attempt any oratorical theatrics. (I’ll admit I dozed off a couple of times.) But it was in the Q&A session that the leader inside her came to the fore, answering some tricky questions with poise, wit and charm; artfully dodging some, deftly deflecting others, but in the process exhibiting the wisdom and charm that got her to where she is, after agonizing decades of working under terrible predecessors. Two speeches at the Forum from world leaders – incidentally, Johnson-Sirleaf’s next destination was the UN General assembly the following day – and I’m already learning a lesson in leadership: you need to be able to talk a lot and make people laugh without actually saying very much. Hmmm.